Only two females remain alive, and scientists hope in-vitro fertilization might be used to preserve the subspecies. At his death, there are only two females remaining alive and the hope is that in-vitro fertilization (IVF) techniques will advance enough to preserve the subspecies. 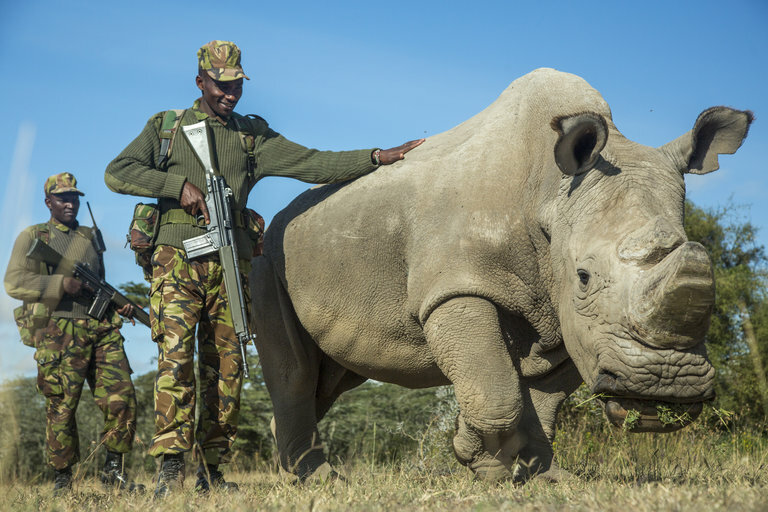 Sudan, elderly by rhino standards, had been ailing for some time, and was euthanized on Monday, according to his keepers at the Ol Pejeta Conservancy, where he lived under armed guard to prevent would-be poachers. However, demand for rhino horn in traditional Chinese medicine and dagger handles in Yemen fueled a poaching crisis in the 1970s and 1980s that largely wiped out the northern white rhino population in Uganda, Central African Republic, Sudan, and Chad. In the 1970s, Sudan "escaped extinction in the wild," when he was shipped to the Dvur Kralove Zoo in the Czech Republic. He did manage to sire two females while at the Czech zoo. His daughter Najin, 28, and her daughter Fatu, 17, are the two females left alive at Ol Pejeta. Further efforts to mate a male southern white rhino with the females — and thus conserve some of the northern white genes — were also unsuccessful. Sudan gained worldwide fame in 2017 after he was featured on the popular dating app Tinder in an effort to raise money for the IVF procedure — which has never been done with rhinos. The plan is to use sperm from several northern white rhino males that is stored in Berlin, and eggs from Najin and Fatu and implant the embryo — which will be created in an Italian laboratory — in a surrogate southern white female, according to Ol Pejeta.